Englishman Arthur Wall invented an accessory motorized propulsion wheel for bicycles in 1910. In 1914, the A.O. Smith Company of Milwaukee, Wisconsin, bought the US manufacturing rights to the Wall Auto Wheel. 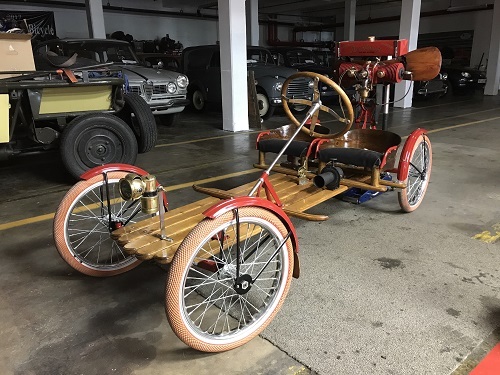 Smith made changes to original design, attached it to an inexpensive, buckboard-style, open-bodies chassis and the Smith Flyer was born. The Guinness Book of World Records lists the Flyer as the least expensive production car of all time. Ads for the Smith Flyer in 1917 claimed it cost $130 ($1,400 in 2015 dollars). By 1919, the company sold the patents to engine manufacturer Briggs & Stratton, who, a few years later, sold the rights to electric motor manufacturer Automotive Standards of New Jersey. Stock Flyers were not powered by a propeller, but the car seen here does have an earlier Aerothrust propeller engine kit mounted. The aftermarket Aerothrust engine had been a popular addition to rowboats, canoes, and even bicycles in the years following WWI. The “Magnalium” dual-fuel alloy twin weighed 50 pounds and produced 3 horsepower. “It burns gasoline or kero-sene, and any man, woman, or child can operate it” said period advertisements. The ingenious mount allowed for variation in height and angle, and could be installed or removed in under a minute.